This reasonably priced, sold-out concert was part of The Great Escape Festival and attracted a festival crowd. Ella Eyre kicked off proceedings, most recently known for her vocal duties on Rudimental’s hit “Waiting All Night”. She certainly warmed up a growing crowd, with her energy and stagecraft. Kelis arrived on stage at ten pm for an hour and twenty minutes, predominantly to promote her latest album, “Food”. Wearing a mid-blue empire-line dress, she began unaccompanied to Nina Simone’s “Feeling Good”, which she returned to midway and finished with, but this was not a covers show. Kelis then launched into four songs from “Food”, which were received with polite applause; I just don’t think the crowd knew the songs. This was further in evidence when the audience raised the roof for the first few bars of “Trick Me”; I think most of them were here for a club set of former glories. The seven-piece outfit were well rehearsed and sounded much bigger especially the brass section which comprised just tenor sax and a horn. 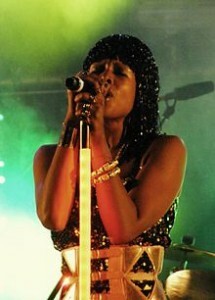 Whether by default or design, Kelis largely swerved the slower moments from “Food”, perhaps hearing the noisy crowd and knowing that a ballad would be unlikely to work; “Floyd”, a dreamier moment from the album was notably absent from the set. At one point Kelis delivered a Mariah Carey-like tour of her upper register, probably just to prove she could, but her voice, husky at times was in fine form. Through her singles, Kelis is known for her assertive brand of sexuality and while this was demonstrated on the night with hits like “Milkshake”, she is much more than a one trick pony. A mother and now a trained chef with her own line of condiments, Kelis is keen to explore other aspects of herself with this album as well as keeping her sensuality. “Food” is a soulful, organic-sounding concoction including some big, brassy horns, but stops short of being a 70’s retro album. The ageing club crowd certainly showed their appreciation for the back catalogue, which made up about a third of songs. Studio-sound singles were reworked into live tracks, the best example of which was “Acapella”, heavy synths were dropped and replaced with jazz piano and horns, though not all the adaptations worked as well. One slowie that sounded pretty good was Labi Siffre’s “Telephone”, by which time Kelis was on her stool and the atmosphere had calmed a little; Kelis was chatty and on-form with her banter. The chairs had been removed from the front stalls to allow for dancing, though it was not much in evidence with the constant tempo changes. Unfortunately, the stage atmosphere did not reach as far as the seated area or probably the circle, which was a shame given that Kelis must have had a fair experience now of playing theatres and not just clubs. Kelis left the stage to a last chorus of “Feeling Good” and didn’t return for an encore. In retrospect, this was a good night out, although I’m not sure it will encourage many to buy the well-rounded “Food”, which may appeal to a different demographic than the crowd here tonight.